On a recent survey of my kitchen, I tallied up the types of fats that I have in my icebox. The verdict is crazy: tallow, lard, bacon fat, duck fat, chicken fat, turkey fat, and of course, butter. I love to use them, they make everything taste awesome, and since our animals are out on pasture constantly, the fats are full of healthy nutrients. Soon, we’ll be slaughtering some geese at Christmas for roast goose for ourselves and for a few lucky customers, and I’ll render up some of that fat as well. I can’t wait! I’m not even sure I have a favorite, but potatoes fried in duck fat are amazing. 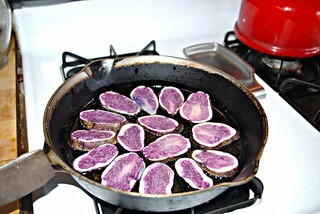 Potatoes fried in goose fat is as well. Okay, I like potatoes fried in bacon fat, too. I like potatoes fried in fat, how about that? Especially home grown potatoes, where I know that no poisons were put into that ground, so there’s no pesticide residue on the skins, and I can eat them. So many vitamins and minerals in potato skins, and so tasty. After reading Michael Pollan’s Botany of Desire long ago and reading about farmers who grew potatoes commercially but wouldn’t eat them, who instead grew a small organic family plot, I vowed then to never eat a non-organic potato again. That’s insanity right there — if you won’t eat what you grow, no one else should either. Every time I read a recipe and it says something like ‘drain the fat from the meat’ and later adds something like olive oil, I cringe. Why on earth would you do that? Animal fats from pastured animals are as healthy as olive oil, and often olive oil sold in this country isn’t even pure. Use the fat! If you google around, there are lots and lots of people talking about why pastured animal fats are healthy. I’ve been convinced for a while, and every time I have my bloodwork done, the results are in the numbers: lots of good cholesterol, very low bad. Go, team. The turkeys we slaughtered this year had a layer of fat on them like we’ve never seen before. Something about either the fermented feed that we provided or the orchard that they foraged in produced fat in a way that didn’t happen on previous years. Turning apples into fat! On the birds that I’ve roasted, I’m saving all that fat, then using it when I cook with the meat. The other night, I made turkey enchiladas with my green enchilada sauce, and fried up the corn tortillas in the rendered turkey fat. Man those came out tasty. Yum! Rendering fat is really easy. Low and slow is the way to go. I usually use my crockpot, on low, with the fat covered with water to start and the lid canted to let the steam escape. 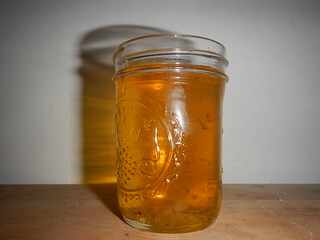 Then ladle the fat off the top, into a Mason jar covered with cheesecloth to strain it first. They’ll store in the icebox for a long time. Lots more detail on how I render lard: Lovely Lard. That method works with any type of animal fat, actually. Great post! People really are much too fat-phobic (and too often when they do use fats, they choose the wrong ones–corn oil or margarine instead of these great animal fats). I get butter from pastured cows, and since I’ve got a half hog at the butcher, I’ve asked him to save the fat for me to make lard. I hope some day to be raising my own animals, but for now I’m just grateful that I have good farmers around that I can buy from. Also: a few years ago, I made lard for the first time–it mostly went fine. I read your post, and I’m curious: why is water added to the fat? When I was looking up how to render lard the first time, I remember that some sites said to add water, some said no water but yes to baking soda. Can you explain any of this? I add water to make it render slower. When I don’t, it starts to brown too quickly, and I don’t get that pure white lard that I like to bake with, and it tastes porkier. If I start out with water, I get lovely lard that doesn’t smell or taste like pork at all for the first day, day and a half. Then the stuff toward the end does, but I use that for cooking meat, so the porky flavor is fine. Thanks again for the post–I finally picked up a half-hog from our farmer over the weekend, and the butcher saved fat for me. Although I wasn’t quite sure how to tell if the water had boiled away, I’m sure that adding it was what made the difference–it was a glorious, pure white. Perfect. Also, the cracklings were delicious. Oh, and I also tried it out as the base fat for making dark chocolate–wonderful. We should be picking up a pig from the butcher any second now and I am ready for more! Glad you had a great result!